Conditions over the next decade are likely to become more challenging with considerable uncertainty and disparity of performance throughout the chemical industry. Since the chemical industry is at an important stage of transformation, external and internal challenges can be addressed through digitalization. This is stated by Swiss automation firm ABB in the first of a two-part white paper it launched recently on ‘Transforming Chemical Operations Through Technology’. 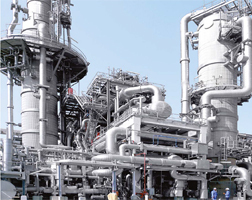 “The complex nature of chemical production renders optimal decision-making particularly difficult,” explains Dr. Zied M. Ouertani, Digital Lead, Chemicals and Refining for ABB’s Industrial Automation Oil Gas and Chemicals Business Unit. “The number of variables to process for maximum performance are enormous. In addition to volatile costs and prices, chemicals can be made in many ways to achieve the same output. Challenges also vary by region. For example, plants in emerging markets must address a skillset gap whereas those in mature ones need to address an exodus of retiring talent. Dr. Ouertani adds, “Digitalization, done well, allows chemical companies to get a highly granular view of their assets which, when viewed in conjunction with data from more traditional business systems, can generate quicker and better insights to drive competitive advantage.